Two grey whales joined at the waist. You don’t often see conjoined animals live successfully in the wild. Conjoined twins have a lot of health concerns (and legal concerns), from birth on, and in the unforgiving natural world, any kind of deformity can end up being a real detriment. You’ll see the occasional domesticated pig with two faces or the occasional calf with six legs, but full conjoined twins is pretty rare, even if they don’t live much past birth. 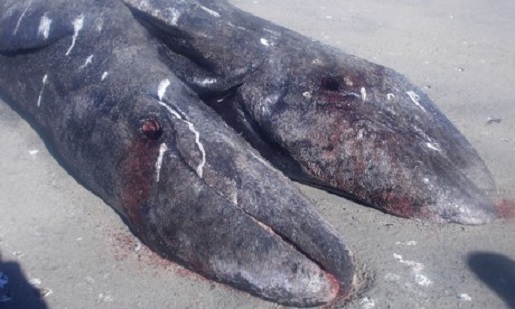 An incredibly rare pair of conjoined twin grey whales was found in Mexico. The pair was discovered in Ojo de Liebre lagoon in Baja California by local fishermen, who soon alerted officials to their unusual discovery. According to marine biologist Benito Bermudez, the animals were born alive, but lived only a few hours before dying. The animals were entirely separate creatures, two heads and two tails, connected by a middle piece. He is taking samples of the animals for study and to find out more about the rare conjoined creatures. Every year, some 20000 grey whales migrate from Alaska to Mexico to mate and give birth; this may be the first of its kind among grey whales.